On the syndicated Chris Matthews Show, Kim Genardo, a political reporter for NBC's Raleigh, North Carolina affiliate, WNCN-TV channel 17, divided North Carolinians into two categories -- those who are "smart" and those who are "conservative" -- as she predicted "smart, educated" primary voters won't be swayed by Jeremiah Wright but was unsure how "conservative, white, rural voters" would vote as she admitted she's not "in touch with them." She contended: "The smart, educated pool of voters who go to the primaries, they're not buying necessarily this guilt by association. But, that being said, what about your more conservative, white, rural voters?" "Mainstream media coverage of the Reverend Jeremiah Wright has drawn a round of barking from some of their own in-house watchdogs," FNC's Brit Hume noted in his Monday night "Grapevine" segment. Hume started by highlighting how PBS ombudsman Michael Getler criticized the soft approach of Bill Moyers in his interview with Wright: "Inflammatory, and inaccurate, statements that Moyers himself laid out at the top of the program went largely unchallenged" and "there were not enough questions asked and some that were asked came across as too reserved and too soft." Hume next turned to New York Times public editor Clark Hoyt's disappointment in the paper for putting a review of Wright's performance in appearances ahead of checking what Wright contended against the reality, scolding his employer: "It was a performance strangely lacking in energy at a potential turning point in the election." Barack Obama and Hillary Clinton each did three broadcast network interviews and three cable network interviews on Monday morning. Only NBC's Matt Lauer pressed Obama on the Reverend Wright controversy. CBS stuck to light horse-race questions, ABC asked Obama about loosening federal scrutiny of the Teamsters union, and CNN's John Roberts declared that they would bow to upset viewers and declare CNN a "Wright-free zone." In all three broadcast appearances, Senator Clinton was hounded from the left over her proposal for a summer gas-tax holiday. ABC presented Warren Buffett as the "oracle from Omaha," while CBS and NBC both touted polls showing voters think the gas tax holiday is a seasonal pandering exercise. But that doesn't mean voters wouldn't support or enjoy their own money being returned to them. The liberal media just can't get over the way Michael Dukakis lost to George H. W. Bush. The New York Times proved it with Sunday's front page "Political Memo," an analysis by Robin Toner, "In '88, a Lesson on Using Symbols as Bludgeons," in which she complained: "[In 1988] the Republicans used the symbols of nationhood (notably, whether schoolchildren should be required to recite the Pledge of Allegiance) to bludgeon the Democrats, challenge their patriotism and utterly redefine their nominee, Gov. Michael S. Dukakis of Massachusetts." Toner fretted: "Like Mr. Dukakis in 1988, Mr. Obama is relatively new to the national scene, and thus vulnerable to being defined by Republican attacks. And like Mr. Dukakis, Mr. Obama lacks experience with the politics of wedge issues on a national stage." "Senator Hillary Clinton is multimillionaire former First Lady with a solid liberal voting record," ABC's Jake Tapper observed in a rare story applying an ideological label to a Democrat but, he pointed out Monday night, "you wouldn't necessarily know that from catching up with her on the campaign trail" where she plays a barbecue-eating populist on trade to the right of Barack Obama on guns and the gas tax. From Indiana, Tapper marveled at how the Democratic presidential candidate now bashes Wall Street though she "has taken millions from Wall Street," and then explained some other campaign spins which don't match her record, including the rarely recalled fact that Bill Clinton raised the tax on gas: "The National Rifle Association says Clinton's name is synonymous with gun control. 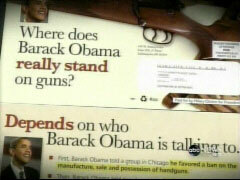 But here, in Indiana, in a new mailer, she suggests Obama would outlaw guns. She has distanced herself from trade deals her husband signed into law and she worked to pass. And while her husband raised gas taxes, she wants to give consumers a summer without them." NBC's Today show invited on Newsweek International editor Fareed Zakaria to promote his book, The Post-American World, on Monday's show and during his segment the author depicted the United States as a nation in decline as he declared the "era" of "'American exceptionalism' is over." As examples of America's declining standing in the world the Newsweek editor cited such facts as China now having the "largest ferris wheel in the world," Minneapolis' "Mall of America" no longer being the largest in the world and Macau having surpassed Las Vegas in the size of their casinos. Over a three day stretch, ABC devoted almost 15 minutes of air-time to a documentary filmmaker who asserts in his movie "Bloodline" that the resurrection of Jesus Christ was a massive hoax perpetrated on humanity. Additionally, on Friday's Nightline, reporter Elizabeth Vargas left out any mention of the bizarre interests of the film's director, Bruce Burgess. He's directed and written documentaries on Bigfoot, the Bermuda Triangle, Area 51 and a secretive look at a U.S. government's supposed cover-up of the alien landings at Roswell. Rosie O'Donnell appeared on Monday's Today show in its fourth hour, claiming that many have confused her "passion for rage" much in the same way as they've misunderstood Rev. Jeremiah Wright. Indeed, claimed the former View co-host, of Obama's former pastor: "I listen to him, and frankly, it made sense to me. I totally understood what he was saying." 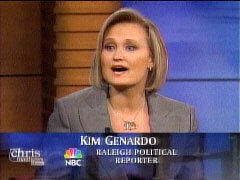 On the syndicated Chris Matthews Show, Kim Genardo, a political reporter for NBC's Raleigh, North Carolina affiliate, WNCN-TV channel 17, divided North Carolinians into two categories -- those who are "smart" and those who are "conservative" -- as she predicted that "smart, educated" primary voters won't be swayed by Jeremiah Wright but was unsure how "conservative, white, rural voters" would vote as she admitted she's not "in touch with them." She contended: "The smart, educated pool of voters who go to the primaries, they're not buying necessarily this guilt by association. But, that being said, what about your more conservative, white, rural voters?" CHRIS MATTHEWS: Let's talk about North Carolina, Kim. It's where you work. He's had a big lead down there, Barack Obama. Has for weeks now. KIM GENARDO, WNCN-TV RALEIGH, NORTH CAROLINA: Absolutely. MATTHEWS: It's narrowing, I hear. Tell me what you hear about that race as it's shaping up. 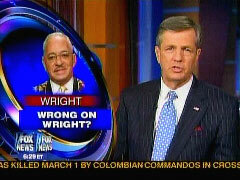 Will it be an up or down on Jeremiah Wright, not Barack? GENARDO: Yeah. Absolutely. We've seen a lot of narrowing. Clinton might be the comeback kid here, but does she have enough to get it done? I don't think so, but it's going to be close. And, and they'll spin that as a victory anyway. But as far as Reverend Wright, we're hearing from voters there that it's not really influencing them too much. At, at least, the smart, educated pool of voters who go to the primaries, they're not buying necessarily this guilt by association. But, that being said, what about your more conservative, white, rural voters? And I don't know that I'm that in touch with them to know if that's going to make them-"
MATTHEWS: What an honest reporter you are! "Mainstream media coverage of the Reverend Jeremiah Wright has drawn a round of barking from some of their own in-house watchdogs," FNC's Brit Hume noted in his Monday night "Grapevine" segment. Hume started by highlighting how PBS ombudsman Michael Getler criticized the soft approach of Bill Moyers in his interview with Wright: "Inflammatory, and inaccurate, statements that Moyers himself laid out at the top of the program went largely unchallenged" and "there were not enough questions asked and some that were asked came across as too reserved and too soft." Hume next turned to New York Times public editor Clark Hoyt's disappointment in the paper for putting a review of Wright's performance in appearances ahead of checking what Wright contended against the reality, scolding his employer: "It was a performance strangely lacking in energy at a potential turning point in the election." Mainstream media coverage of the Reverend Jeremiah Wright has drawn a round of barking from some of their own in-house watchdogs. 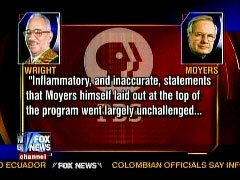 The Bill Moyers interview of Reverend Wright on PBS drew heavy criticism from viewers and network ombudsman Michael Getler wrote, quote: "Inflammatory, and inaccurate, statements that Moyers himself laid out at the top of the program went largely unchallenged...There were not enough questions asked and some that were asked came across as too reserved and [too] soft'€'This came across to me," he said, "more as a conversation among theologians than it did as a truly probing interview with a truly controversial person who had said some truly inflammatory things." New York Times public editor Clark Hoyt also was critical of his paper which he said angered some readers by putting a review of Wright's recent appearances on its front page before ever reporting what the reverend actually said in a news story. Hoyt wrote, quote: "It was a performance strangely lacking in energy at a potential turning point in the election." SAWYER: Well, I want to turn to the gas tax. You've been sharply critical of Senator Clinton's plan to suspend the tax on gas prices out there. But for people trying to pay $3.62, on average, a gallon of gas, what do you say to them at the summer? What do you offer them for this summer? OBAMA: We shouldn't pretend that we're offering them something by suspending a gas tax that at best would save 30 cents a day for a grand total of $28 and is more likely, in fact, to result in no savings because oil companies won't pass on those savings to consumers. They'll just fill the gap. SAWYER: Want to turn to the news of the day. In the front page of Wall Street Journal today, it says that before you won the endorsement of the teamsters, that you indicated to them that you would support ending strict federal oversight of the union, which was imposed back in the early '90s to deal with corruption. Was that commitment made to them? OBAMA: You know, I wouldn't make any blanket commitments. What I' ve said is we should take a look at what's been happening over the teamsters and at all unions to make sure that, in fact, you know, organized labor is able to represent its membership and engage in collective bargaining in accordance to what we've always believed. SAWYER: But if they heard you to be saying that you did support, you did support lifting this strict federal oversight, are they wrong? OBAMA: No. What I've said is that I would examine what is going on in terms of the federal oversight that's been taking place, but it's been in place for many years. The union has done a terrific job cleaning house, and the question is whether they're going to be able to get treated just like every other union, whether that time has come and that's something that I'll absolutely examine when I'm president of the United States. SAWYER: I want to turn to the whole question of suspending the gas tax because someone else has weighed in this morning. As we know, some economists have been saying it won't work. Speaker Pelosi has said, basically, it's not going to happen and that it would defeat everything we've been trying to do to lower the cost of oil. Here is another voice and it is the oracle of Omaha himself, Warren Buffett. WARREN BUFFETT: You decide that it makes sense to get rid of the gas tax for the summer, you should say it makes sense entirely and it funds the highway construction, you know, operation, so I think it would be a mistake. SAWYER: He says he thinks it would be a mistake because if you want to get rid of it for the summer just say you're going to get rid of it, period, but it does fund construction. CLINTON: Well, but, Diane, that's a fundamental misunderstanding of my position. You see, there are three positions here. Senator Obama is against giving people relief from the gas tax this summer at all. Senator McCain wants to lift the gas tax but not pay for it and once again I feel like Goldie Lock, right in the middle here, I want to lift the gas tax and pay for it. I want to pay for it out of the excess profits that the oil companies are making, record profits, unprecedented. SAWYER: But what's the guarantee that oil companies won't just raise their prices down the road? # CBS. On CBS's The Early Show, co-host Harry Smith touted the latest CBS News/New York Times poll, showing Obama has an eleven-point lead over McCain in the general election, and Hillary has a lead over McCain by twelve points. But not every poll had good news, as Smtih suggested to Obama: "Some of your supporters would be concerned, though, if they looked at the front page of the USA Today today, because right now, Hillary Clinton actually leads you 51 to 44% nationally. Indiana is a toss up, North Carolina looks to be closing fast. If she wins both of those contests tomorrow, won't she be able to say, 'I'm the one with the momentum,' shouldn't the superdelegates go in her direction?" Co-host Maggie Rodriguez also went to the new CBS poll as she questioned Hillary: "You spent a lot of time promoting this gas tax holiday, which Senator Obama and many economists oppose. I'd like to show you a new CBS News / New York Times poll. The first shows that Americans are split whether this is a good idea. 49% say it's bad, 45% say it's good and most voters overwhelmingly believe that candidates who want to lift this gas tax only want to help themselves politically. Given all that, Senator, how do you continue to argue for it?" LAUER: I want you to bear with me right off the top. I know you said to Tim Russert on Meet The Press yesterday that you're talking way too much about Reverend Wright and not enough about gas prices and food prices and Iraq. But I do want to go over something that Charles Krauthammer wrote in an op-ed in the Washington Post, and he asked this question of you, basically, and that is, what did Reverend Wright say differently in his speech before the National Press Club? What did he say that was different from what he's been saying all along that caused you to finally say enough is enough? OBAMA: Well, I think what it is, Tim, is you know, that no person is defined by a few snippets taken over the course of a number of years, and so I wanted to give him a chance to explain and provide a context for what he had said, and perhaps recognize that he had offended the American people, and he chose instead to amplify and become even more divisive in front of a public audience with a major platform. And that indicated to me that, you know, he wasn't maybe the person I thought he was, and I thought it was very important to make sure that people were absolutely clear that those weren't the things I stood for. LAUER: So, so in other words, if he makes these comments in front of a national audience at the National Press Club, and it turns out on national TV, it's different than when he says them in a room from the pulpit in his own church? OBAMA: -about these issues. And I think that the American people recognize that, you know, it's time to focus on the things that really matter to them. LAUER: Is this, does this go to a larger picture of judgment? Do you think that some American voters might look here at this entire issue and say this goes to the judgment issue? And if not, why not? OBAMA: Well, Tim, I think that all of us have people in our lives who may have done some good things, and then we also see them doing some things that, that are disappointing, and ultimately, I'm the, I'm the one who is running for president. Like Sawyer, Lauer asked Obama the devil's advocate question that maybe gas tax relief would help solve emotional strain: "I think you've called it a gimmick and pandering and said that it really won't bring much relief. I'm just curious, what's wrong with even a little relief, even if it's largely symbolic to ease, in a minor way, the financial and perhaps even more in a major way the emotional strain that some people are feeling right now?" VIEIRA: But Senator, let me, let me ask you about the gas tax. CLINTON: That's the beginning of trying to stand up to the oil companies, which is something we need to do. VIEIRA: Let me talk to you about the suspending the gas tax, because there's apparently no economist that says that it is a good policy. And yesterday you were asked if you could name a single credible economist who supports you, and you said this, you said, "I'm not going to put in my lot with economists." You call that elite opinion. So are you saying if you were President, you would not seek the counsel of any economists? VIEIRA: But Senator, you say that Senator Obama is out of touch with the American public on a lot of these issues. There is a new New York Times/CBS News national poll that's out today that says 70 percent of Americans think the idea of suspending the gas tank, tax is mainly a political tactic. So if you look at that poll, it would suggest that you're the one out of touch with the American public. CLINTON: Well, I think a lot of the people who answered that, because I've heard a lot of commentary, don't know that I want to make the oil companies pay the gas tax out of excess profits. But there's a larger question here. I think that if we don't begin to put together the political will to take on the oil companies, we're never going to deal with our long-term addiction on foreign oil. We are never going to begin to have home-grown fuels that can really compete. Vieira didn't consider that 70 percent could say a gas tax holiday is a political tactic, and still favor it. As CBS's Rodriguez noted, and Vieira did not, opinion was roughly split down the middle. # CNN's John Roberts apparently took David Gergen's move-on advice to the media from last week, and during his interview of Barack Obama on Monday's American Morning, he declared out of the gate that he wasn't going to ask the Democrat from Illinois about his former pastor. "I want to just stipulate at the beginning of this interview, we are declaring a Reverend Wright-free zone today. So, no questions about Reverend Wright. Our viewers want us to move on, so this morning we're going to move on. Is that okay with you?" Obama reacted favorably to this declaration. "Fair enough. That sounds just fine." The memory of that campaign -- reinforced, for many, by the attacks on Senator John Kerry's Vietnam war record in the 2004 election -- haunts Democrats of a certain generation. The 1988 campaign was, in many ways, the crucible that helped create Bill Clinton's centrist philosophy and his fierce commitment to attack and counterattack, which drove the politics of the 1990s. Senator Barack Obama has promised a different politics, one that rises above the fray and the distractions of wedge issues. As Glenn Greenwald, a columnist for Salon, recently put it, "The entire Obama campaign is predicated on the belief that it is no longer 1988." Even with so many big issues at stake this time around, the race between Mr. Obama and Mrs. Clinton has often been focused on questions of values, background and character -- witness the recent fixation on Mr. Obama's ties to the Rev. Jeremiah A. Wright Jr., or the continued unfounded rumors that Mr. Obama is a Muslim. Like Mr. Dukakis in 1988, Mr. Obama is relatively new to the national scene, and thus vulnerable to being defined by Republican attacks. And like Mr. Dukakis, Mr. Obama lacks experience with the politics of wedge issues on a national stage. Attacks on a presidential candidate's patriotism, are hard for many politicians to take seriously. "Unless you're talking about the Manchurian candidate, the idea that someone who put their heart and soul into running for president didn't care deeply for their country is kind of ridiculous," said Drew Westen, a psychologist and political consultant. "The GOP is attacking our patriotism!" is a running talking point among poor-me Democrats around election time, one reliably amplified by the party-helpers at the Times. Rarely is any actual evidence offered to accompany the accusation. Michelle Obama has already drawn conservative fire for declaring that, because of her husband's success and the voters' hunger for change, "For the first time in my adult lifetime, I'm really proud of my country." And Mr. Obama has been questioned about why he does not wear a flag pin every day. In 1988, one of the central attacks revolved around the Pledge of Allegiance. Mr. Dukakis, as governor, had vetoed state legislation in 1977 that required teachers to lead their students in the pledge. He did so on the basis of an advisory opinion from the state court, which said the legislation was unconstitutional. Mr. Dukakis, a Harvard lawyer surrounded by other Harvard lawyers, believed himself on very firm ground. But by August 1988, his Republican opponent, Vice President George H.W. Bush, was rousing huge crowds with a contemptuous question: "What is it about the Pledge of Allegiance that upsets him so much?" "Senator Hillary Clinton is multimillionaire former First Lady with a solid liberal voting record," ABC's Jake Tapper observed in a rare story applying an ideological label to a Democrat but, he pointed out Monday night, "you wouldn't necessarily know that from catching up with her on the campaign trail" where she plays a barbecue-eating populist on trade to the right of Barack Obama on guns and the gas tax. From Indiana, Tapper marveled at how the Democratic presidential candidate now bashes Wall Street though she "has taken millions from Wall Street," and then explained some other campaign spins which don't match her record, including the rarely recalled fact that Bill Clinton raised the tax on gas: "The National Rifle Association says Clinton's name is synonymous with gun control. But here, in Indiana, in a new mailer, she suggests Obama would outlaw guns. She has distanced herself from trade deals her husband signed into law and she worked to pass. And while her husband raised gas taxes, she wants to give consumers a summer without them." Giving Hillary Clinton her due, in Monday's story Tapper reported Clinton's populist pitch "seems to be working" and featured a soundbite from an Indiana woman who hailed her as "brilliant." JAKE TAPPER: Well, Senator Hillary Clinton is a multimillionaire former First Lady with a solid liberal voting record, but you wouldn't necessarily know that from catching up with her on the campaign trail. She has repackaged herself as a working-class hero. New York Senator Hillary Clinton has taken millions from Wall Street. Less than a year ago, she appeared on the cover of Fortune magazine: "Business Loves Hillary." But this is what Clinton sounds like here in Indiana. HILLARY CLINTON: Why don't we hold the Wall Street money brokers responsible for their role in this recession? TAPPER: Meet the new populist Hillary Clinton. HILLARY CLINTON CLIP #1: We have eaten barbecue from one end of this state to the other. HILLARY CLINTON CLIP #2 DATED SUNDAY: I am unabashed. I am unapologetic. I am going to fight for the middle class, and I am going to take on the oil companies. TAPPER: The National Rifle Association says Clinton's name is synonymous with gun control. But here, in Indiana, in a new mailer, she suggests Obama would outlaw guns. She has distanced herself from trade deals her husband signed into law and she worked to pass. And while her husband raised gas taxes, she wants to give consumers a summer without them. HILLARY CLINTON: Senator Obama wants you to pay the gas tax this summer instead of trying to get it so the oil companies pay it out of their record profits. TAPPER: Policymakers of all stripes think that proposal is a lousy one that may not even save consumers money. That prompted this response from the former First Lady. HILLARY CLINTON, ON THIS WEEK: Elite opinion is always on the side of doing things that really disadvantage the vast majority of Americans. TAPPER: And in this narrative, Obama is the elitist. HILLARY CLINTON: And he's always saying, oh, you know, that's just like $20. Well, you know, for a lot of people, $20 is something, right? 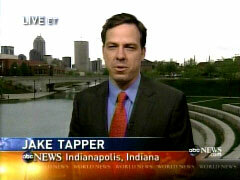 TAPPER: Here in Indiana, this pitch seems to be working. MAN: Her work ethics and her working-class roots really stuck to me. And her determination to get where she wanted to get. TAPPER: And what about you? WOMAN: Well, number one, she's brilliant. TAPPER: The goal, of course, is to win over the support of white working-class voters. And she has a not-so-secret weapon in small towns here in Indiana and throughout North Carolina. She has been sending her husband, former President Bill Clinton in North Carolina today, he went to Lewisburg, Roxboro and Henderson. 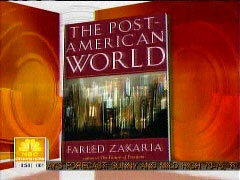 NBC's Today show invited on Newsweek International editor Fareed Zakaria to promote his book, The Post-American World, on Monday's show and during his segment the author depicted the United States as a nation in decline as he declared the "era" of "'American exceptionalism' is over." As examples of America's declining standing in the world the Newsweek editor cited such facts as China now having the "largest ferris wheel in the world," Minneapolis' "Mall of America" no longer being the largest in the world and Macau having surpassed Las Vegas in the size of their casinos. MEREDITH VIEIRA: The baseball legend Satchel Paige famously said, "Don't look back, something might be gaining on you." So should the United States be looking over its shoulder? A new book called, "The Post-American World" argues that the rest of the globe is catching up to us. 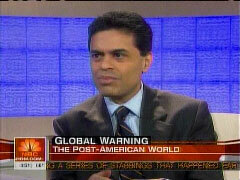 Newsweek International editor Fareed Zakaria is the book's author. Fareed, good morning to you. FAREED ZAKARIA: Good to see you, Meredith. VIEIRA: Nice to see you too. You say the book really isn't so much about the decline of the U.S., as it is about the "rise of the rest." What do you mean by that, "The rise of the rest?" ZAKARIA: Well, it occurred to me really when I was in a taxi in Singapore. I saw a ferris wheel and I said to the cab driver, "Oh, this is so nice, you've got a ferris wheel," and he looked at me and said, "Sir, it's the largest ferris wheel in the world." Then I was at a mall in China and I'm looking at it and thinking, this is very large. And he says, "It is the largest mall in the world." And I said to him, "No, no, no, the Mall of the Americas in Minneapolis is the largest." He said "Sir, that doesn't make the top 10 anymore." So it occurred to me that while we were sleeping, the rest of the world had been gaining, and it's happening everywhere. It's not just China and India. It's happening in Brazil. It's happening in Costa Rica. What I describe in, in the book is the rise of the rest, that is to say, all of these countries, 140, uh, 125 countries, growing at four percent, five percent a year, and gaining on us in all kinds of ways. And it, and how important it is for us to understand this new world. VIEIRA: Why, why haven't we paid attention, do you think? ZAKARIA: Well, you tell me, Meredith. I mean, look at the presidential campaign. You know, we've been talking about whether Hillary Clinton landed in a corkscrew 16 years ago on a Bosnian airfield, whether Barack Obama had relations with William Ayers, who when he was in, you know, grade school may have exploded some bombs, whether McCain's used his wife's plane a couple of times. Where are we discussing the big issues? It seems to me this is the, the central issue we have to face as a nation. VIEIRA: But what does it mean to us as a nation, this "rise of the rest?" Is it necessarily a bad thing for us, a good thing for us? ZAKARIA: I call it, "The Post-American world," because it's not a world that's going to be dominated by the United States, but it's a world in which lots of good stuff is happening, right? The rest of the world is rising. Billions of people are coming out of poverty. They're consuming, they are investing, they're inventing, they're dreaming. So if we understand it, it could be a great world. It could be a win-win for all of us, but we have to understand it and we have to get to work. VIEIRA: Do you get, get any sense from the candidates that they understand it. That they, that they see this? As a real issue? ZAKARIA: I don't, honestly. I mean I think that some of them do talk about it. Obama probably most explicitly. But on the campaign trail, all you hear about is trivia. I mean so far, there have been no discussion of these issues. And what I worry about is, you know, the rest of the world is not going to stop. They're, they're moving ahead. They're gaining ground. London is now probably more important than New York as the world's leading financial center. You know, these things are happening. I was in Las Vegas the other day and I'm, was talking to some people and said, "Well, at least we have, we have casinos." He said, "No, the casinos in Macau are now three times as big as the casinos in Las Vegas." VIEIRA: And if you look at the polls, Americans feel, a vast majority feel that we're headed in the wrong direction. They sense crisis all around. Is that a misconception? ZAKARIA: It's stunning. You're absolutely right. The numbers are frightening. I mean, we have more gloom these days than we've had in 40 years. I think it's not a misconception. People are sensing something is going on around the world. And for the first time, they feel as though the changes in the world are not being directed from here but in foreign lands by foreign people. I think they're right, but what we need to understand is we can still be at the center of this new world. ZAKARIA: We have to adjust. First of all, it's a much more competitive world. We have to be benchmarking. We have to be asking ourselves, what's going on? Give you simple example. Meredith there are three countries in the world that have not adopted the metric system: Myanmar, Liberia, and the United States. So we look around the world and "We say, that's okay. Those standards are for you. We're special, we're different." And what I'm saying is that era of kind of "American exceptionalism" is over. VIEIRA: A real wake-up call. Fareed Zakaria, thank you very much. VIEIRA: The book is called "The Post-American World." Weir then wondered: "Why should we believe you of all people when it comes to something this huge?" Vargas, during her nine minute promotion of the documentary, failed to find time for such a query. She did, however, repeat verbatim, the crux of Burgess's argument: "One theory is that [19th Century French priest] Father Sauniere was paid for his silence, because he'd found proof of a shocking secret that Mary Magdalene, known as the prostitute in the Bible was actually married to Jesus. And that Jesus and Mary Magdalene had a child. That after the crucifixion she fled with that child here to this rugged and very remote corner of southern France. That their descendants and their secret were protected in the Middle Ages by a group of crusaders whom historians called the Knights Templar...The novel, The Da Vinci Code is based on the theory that those knights also buried some sort of proof that the bloodline of Jesus exists." O'Donnell also defended Wright's conspiracy theory view on AIDS, chalking that up to Wright's "genetic memory" of the Tuskegee Institute. O'Donnell incorrectly asserted the U.S. government infected the patients in that syphilis study. HODA KOTB, co-host: You know Rosie there has been a void on morning TV since we don't hear your opinions. Every times there's like, I was going through a story today "I wonder what Rosie thinks about that." What about, can I ask you about just the little Jeremiah Wright thing? KOTB: This is a big deal. What have you been thinking when you've been watching this stuff in the headlines? O'DONNELL: Well, did you see Bill Moyers recently give his speech about what happened after Reverend Wright was on his show? O'DONNELL: He got thousands of e-mails, over like 5,000 e-mails and some of them irate, some of them understanding. But what it came to, boil down to in his mind is the fact that, you know, this man is, is following a tradition of black preachers and that there is a righteous indignation about people who were only considering three-fourths a person until fairly recently in our history. And that his anger, which annoys some and forces some to look at issues that America is not really ready to face, is the actual issue. That racism does exist in this country and it's still thriving. And some of the things that Jeremiah Wright says he's held accountable for and Oprah, not Oprah, Obama is held accountable for. But there are things that white preachers said that are just as insane. KATHIE LEE GIFFORD, co-host: All of them should be held accountable. O'DONNELL: Pat Robertson saying that, you know, gays and feminists were responsible for the 9-11 catastrophe. GIFFORD: A little bit of move. O'DONNELL: Here's what I think. There is a place in the world, an inspirational, liberational kind of preaching that Reverend Wright does that when you read something that sort of, I was not as offended as the people in the polls that I read. I listen to him, and frankly, it made sense to me. I totally understood what he was saying. GIFFORD: Which part makes sense to you? GIFFORD: That we introduced AIDS into the black community? GIFFORD: And women and women. O'DONNELL: -and women, and not support the war. And not support the mission. HODA KOTB, co-host: Do you think the Jeremiah Wright thing is going to have a big impact on, on, well tomorrow basically, Indiana and North Carolina? Do you think that's going to have an impact? O'DONNELL: I think it will because I think there are, you know, five companies that own all of the media in America and once they get a story they run it, and run it, and run it. CNN had a field day. For three weeks all I heard was Jeremiah Wright and, and, you know, the horrible Miley Cyrus photos. KOTB: Well, there's a quote, and I don't have the exact one, they kind of gave me a little sketchy one. It says Barbara [Walters] says, "Rosie tells me she loves me. She tells me I'm old and then she tells me she loves me. She's a great talent with emotional issues." KOTB: You've done a lot for the show. O'DONNELL: Well, just like Reverend Wright, some people confuse passion for rage. You know, if you have passion and you're from this family in Long Island without a mom, with five kids having to make their way through live, you know, I have a lot of passion about things I believe in. You know, passion on that show is not number one. And when somebody would say something that I found insane, I would say, "that's insane!"